Koufu location at Anchorpoint Mall in Singapore; taken October 2018. Food court operator Koufu reported on Friday third-quarter net profit fell 34.5 percent on-year to S$4.6 million, mainly on higher rental costs during the fit-out period for three new food courts opened this year. That was compared with costs for only one food court and one coffee shop in 2017, it said in a filing to SGX after the market close on Friday. In addition, net profit was affected by one-off IPO expenses and finance income from convertible notes of S$1.6 million, Koufu said. Revenue for the quarter ended 30 September rose 3.6 percent on-year to S$57.6 million amid higher revenue for the outlet & mall management and F&B retail segments, it said. “Synergistic business segments – outlet and mall management as well as F&B retail – both registered increased contributions during the period due to a year-on-year increase in number of outlets, despite the partial closure of the Marina Bay Sands (MBS) food court for refurbishment and upgrading works in two phases,” Koufu said in the statement. Koufu declared an interim dividend of 1.0 Singapore cent, for a payout ratio of 119.5 percent of net profit for the quarter. For the nine-month period, net profit fell 13.4 percent on-year to S$17.0 million, while revenue rose 2.6 percent on-year to S$166.8 million, Koufu said. 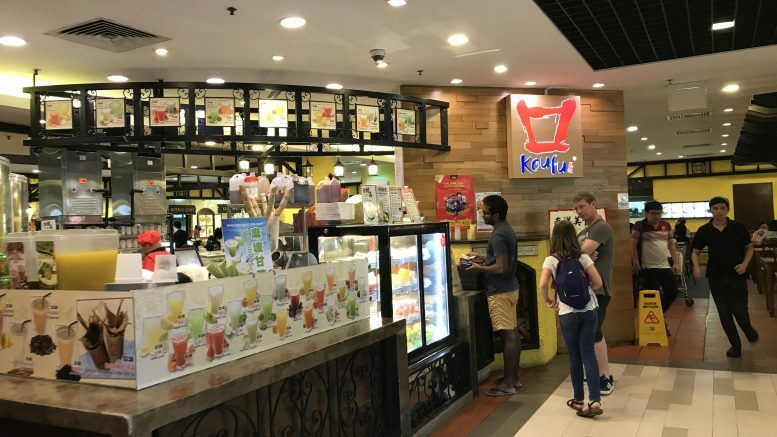 Koufu’s first entry into hospitals, the Koufu food court at Sengkang General and Community Hospital, opened in July and already has positive contributions to the outlet & mall management segment, it said. The Rasapura Masters food court at MBS also started full operations in August after refurbishment works finished in July, and that includes an R&B Tea F&B kiosk, it said. It said it had secured six new locations for R&B Tea in Singapore, with one opening in SingPost in October and another five slated for later in the current quarter, to bring the total to 11 by end-2018. In the fourth quarter, it plans to open an Elemen full-service restaurant at the new Paya Lebar Quarter mall, a Happy Hawkers coffeeshop at T-Space @ Tampines and another Koufu food court at The Woodgrove. Koufu said it also plans another Koufu food court in Buangkok Green by the first quarter of 2019. Koufu’s network includes 48 food courts, 14 coffee shops, a hawker center and a commercial mall under the outlet & mall management segment, while the F&B retail segment has 75 self-operated F&B stalls, seven F&B kiosks, nine quick-serve restaurants and three full-service restaurants. In Macau, Koufu said it opened its first Supertea F&B kiosk in Cotai Sands, Macau, in May, adding to a Macau network that includes one food court, two F&B stalls and one F&B kiosk. It said it expected to pen a Koufu food court site at Macau University in the first quarter of next year.